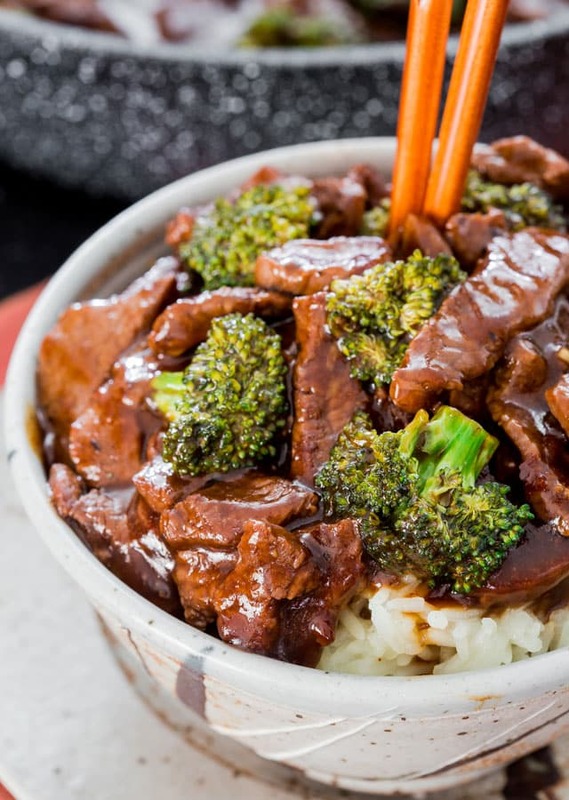 Forget take-out with my Easy Beef and Broccoli Stir Fry recipe – In 15 minutes you can have this insanely delicious beef and broccoli stir fry! Way better than any restaurant version! I’m sure you all have your favorite recipes that you make often, if not on a weekly basis, mostly because you just love them so much and they’re easy. Well this is mine! It’s the easiest dish to put together and the flavors are out of this world. I remember the first time I made it, hubs thought I made a mistake and that’s why it turned out so good. Lots of faith he’s got in me, doesn’t he? But I showed him and made it over and over again, and every single time I got the same result; Absolute deliciousness. The great thing here is that it’s quite affordable to put together too. You can use a cheaper cut of beef like a flank steak and then all you need is a head of broccoli. Most of the other ingredients should be right out of your pantry. But it’s not the beef nor the broccoli that I find are the stars of this recipes. It’s the sauce. It’s garlicky, as usual I put a lot of garlic, it’s salty from the soy sauce, it’s spicy, it’s smooth, it’s just complete yumminess. 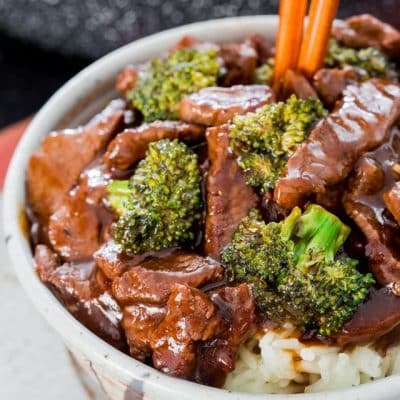 What Ingredients Do I Need for Beef and Broccoli? Chances are you’ll already have most of these ingredients hanging out in your kitchen! Keep scrolling for the full recipe and ingredient amounts. Soy Sauce – I always use low sodium soy sauce. Cornstarch – This ingredient is completely gluten free, and will create that nice, thick, and glossy sauce. You can adjust the amount of cornstarch in the recipe to suit how thick you’d like your sauce. 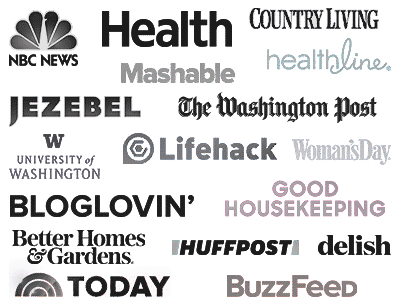 Garlic – The more garlic the merrier! I love to use fresh garlic whenever I can. Sherry – Don’t bother going to a liquor store to get this ingredient- you can find great cooking sherry at your local grocery store. Chinese cooking wine or vinegar will also work in place of sherry. Honey – A little touch of sweetness is exactly what we need to balance out the saltiness of the soy sauce in this recipe. You can adjust for your sweet-tooth preference. Fresh ginger – Using fresh ginger makes a world of difference in this recipe! I store my ginger in the freezer so it’ll last longer. Peel it using a spoon, and use a microplane to get a nice fine mince. Sesame oil – Make sure you find a nice high quality sesame oil. If you can find toasted sesame oil, you will seriously fall in love with this ingredient! So good. Red pepper flakes – Not a fan of spice? You can leave this ingredient out. Love to breathe fire? Add as much as you want! Beef broth – Chicken or veggie stock will work in place of beef broth if that’s what you have handy. The flavor, though, will be a lot deeper and more authentic with beef broth. Olive oil – Other oils with a high smoke point such as vegetable, sunflower, safflower, peanut, and avocado oil are great for this recipe. Steak – I used flank steak for this recipe. Skirt steak would also work well. These are nice and tender cuts which make them perfect for high-heat cooking. They’re also quite cheap! Broccoli – I used 1 head of broccoli. You can, of course, use more or less depending on you preference. Not a broccoli fan? Try out bell peppers, carrots, cauliflower, snow peas, onion, or a combination! Can I Make This Recipe With Chicken or Pork? Yes, you can! You might not be able to call it beef and broccoli anymore, but it’ll still be delicious. Make sure you slice the chicken or pork in small bite-sized pieces. Prepare the beef: Cut the beef in really thin pieces. I find it easier sometimes if the meat is a bit frozen it’s way easier to slice it thin. To do this place the beef in the freezer for 20 minutes before slicing it. Make the sauce and cook the beef: Mix all the sauce ingredients together. Cook the beef for about 5 minutes in a little bit of olive oil, just until it starts to brown then you add that yummy sauce. You should see it start to thicken almost immediately from the cornstarch. If you don’t like or want to use cornstarch, you could use flour instead. Finish the stir fry: Add the broccoli and cook everything for another 2 minutes, or until the broccoli is tender. I like a little bit of crunch left in my broccoli. If you want it more tender, cover the pan with a lid and let everything steam together. 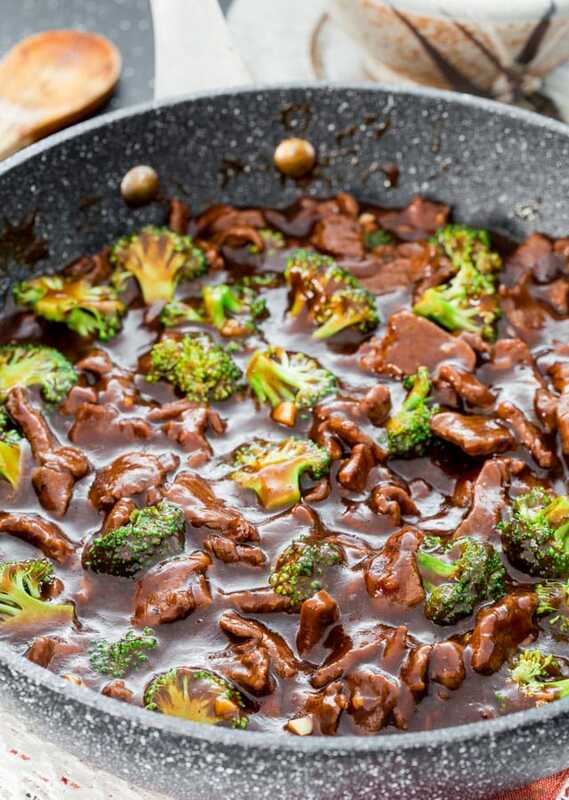 That’s all there is to this little beef and broccoli stir fry. It’s so damn good, it’s way better than takeout, trust me and you know what ingredients go into it. You’ll love it! This recipe is the BEST EVER! Made it on the weekend, just in time after making a fresh batch of beef stock. Best BEEF BROCCOLI ever! Thanks a million for this easy and super delicious recipe! This will last 3–4 days in the fridge when stored in an airtight container, and 3–4 months in the freezer. You can reheat it either in the microwave, or covered in a pan over medium heat. I love to serve my beef and broccoli over rice such as Basmati or Jasmine rice, but sometimes I love it over noodles. Try it over ramen, soba, udon, or rice noodles. 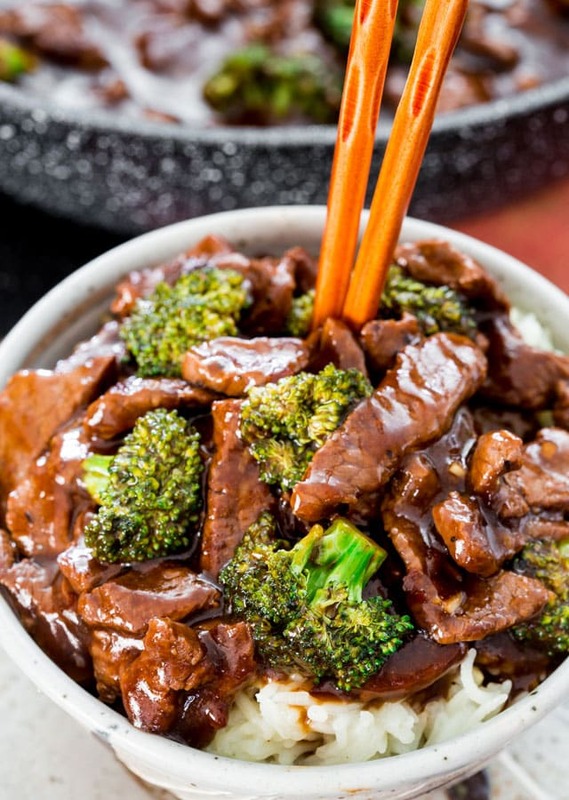 Forget takeout with my Easy Beef and Broccoli Stir Fry recipe - In 15 minutes you can have this insanely delicious beef and broccoli stir fry! Way better than any restaurant version! In a medium bowl, whisk together the soy sauce, cornstarch, garlic, sherry, honey, ginger, sesame oil, red pepper flakes, Sriracha sauce and beef broth. Set aside until ready to use. Heat the olive oil in a large skillet and cook the steak until it starts to brown, about 4 to 5 minutes. Add sauce and stir in with the steak, it should start to thicken immediately. Add broccoli and cook for an additional 2 minutes until broccoli is tender and sauce is thickened. A good substitute for the sherry would be apple cider. Nutrition information does not include rice or noodles. This was a crowd pleaser. It was the best sauce I have tried. Not too strong. Has anyone made this with chicken instead of steak. If so how was it? 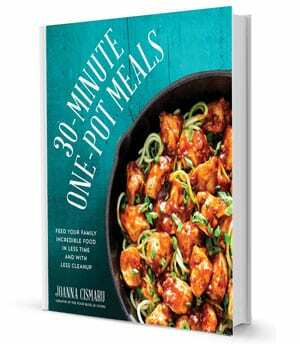 I’ve made many recipes from this site (you’ve never let me down, Jo!) but I found this sauce to be a little potent. It totally overpowered the dish and you needed a lot of rice to tame it down. I followed the recipe to a T.
You can always use a bit less soy sauce and sub in some beef broth to create a more mild flavor! Ingredients like sriracha, garlic, ginger, etc. are also totally okay to adjust to your preference. Can I use apple cider vinegar instead of sherry? Great recipe, we added cashew nuts for an extra bit of texture. I will make this again. Wow! Better than take out! My 2 year old daughter loved it which made me love it even more! My whole family loves this recipe! Slice flank steak 1/4 ” thin strips against the grain. Marinade overnight for tender beef. Followed rrcipe exactly but substituted apple cider vinegar for Sherry. Good recipe and my first try with trying to do beef and broccoli. Just have to keep work with the beef. Still a little tough I used rice wine and corn starch with some soy sauce for the marinade. This recipe is the BEST EVER…! Made it on the weekend, just in time after making a fresh batch of beef stock. This recipe was soooo yummy!! My family ate it up!! What are the best noodles to use instead of rice for this recipe? I would go with ramen noodles or some type of Asian style noodles. I had butternut squash (shredded). We love this recipe! Quick, easy and yummy. Added green peppers. This is my go to recipe 🙂 I do use natural rice wine vinegar vs. sherry and I add big chunks of yellow onion. This is was really good. Could not resist adding other vegetables- carrots, celery, onion, red pepper.